Gourmandistan’s love of soy, stir-frying and other Asian ideas has led us to explore many Chinese dishes, as well as Chinese restaurants around the globe. Like many Americans of a certain age and geography, both Michelle’s and Steve’s first exposures to “Chinese food” came from menus full of chop suey, crab wontons, General Tso’s chicken and other items never dreamed of in China. We grew older and discovered dishes from Szechuan, Hunan and other regions of China, along with restaurants that (sometimes with a bit of arguing) would let us order from the “real” Chinese menu. No matter how sophisticated we thought we became, however, we never gave up our affection for War Sui Gai (or War Su Gai), one of the iconic Cantonese-American dishes from our youths. 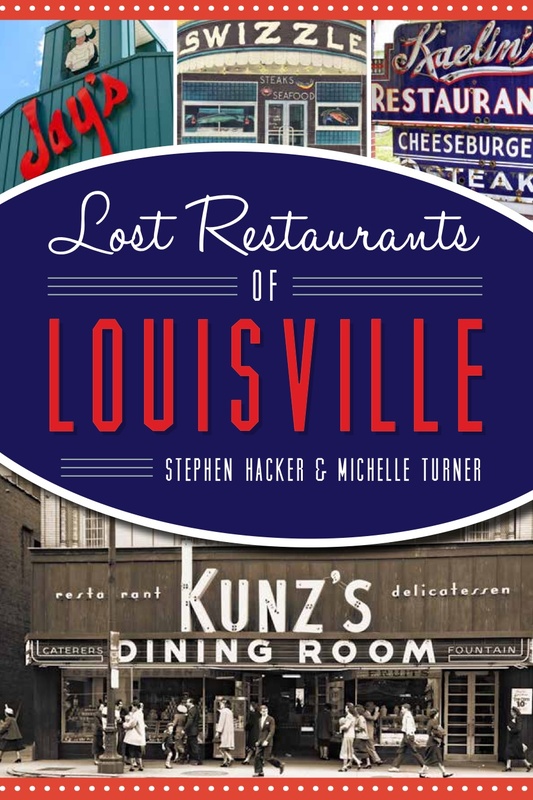 While researching our upcoming book about old restaurants (yes, that’s why we’ve been absent and, yes, we’d love for you to buy it! ), we discovered that War Sui Gai was also known as “almond boneless chicken” or “ABC.” We also discovered that Chinese people are not the only ones unfamiliar with it. Outside of Michigan, Ohio and a few other places, the dish is not recognizable by most Americans either. War Sui Gai was brought to Louisville in the 1960s by a beloved restaurant called Hoe Kow whose chef/owner hailed from Detroit, which along with Columbus, Ohio, claims to be the birthplace of ABC. 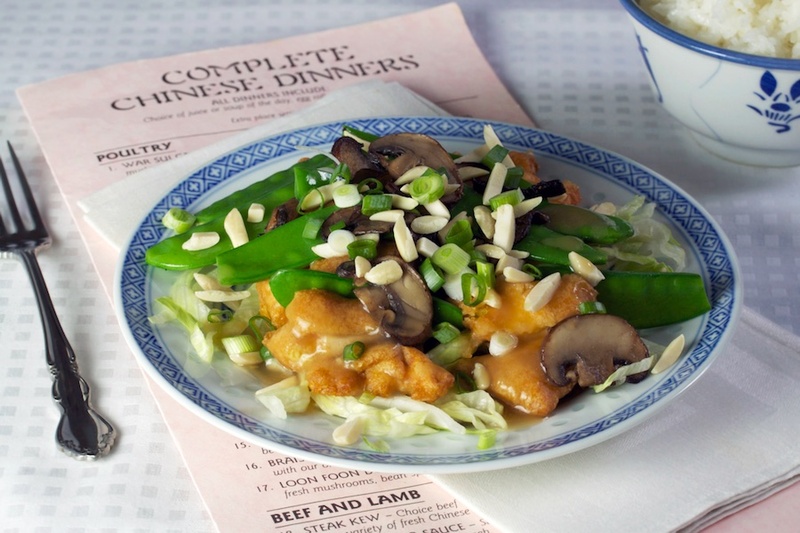 While it may be far from “authentic Chinese,” when done properly it can be delicious. Boneless chicken breasts are dipped into a thick, tempura-style batter, then deep-fried until golden brown. Cut on the diagonal, the fried chicken pieces are set on a bed of shredded iceberg lettuce, and a brown mushroom gravy is drizzled over the top, then sprinkled with almonds and green onions. Pea pods, apparently, were a Louisville addition. Unlike chow mein, egg foo young, chop suey, fortune cookies and egg rolls (all of which were likely created in America), ABC somehow hasn’t spread to other parts of the country. Hopefully Gourmandistan has just changed that. Why should Detroit, Columbus and Louisville have all the goodness? Toss chicken with salt and sherry to coat well. Marinate for at least 15 minutes. Blanch pea pods in rapidly boiling salted water for a few seconds. Drain in a colander, then shock in ice cold water. Drain again and set aside. In a wok or skillet, heat sesame oil and one teaspoon neutral oil. Add mushrooms and stir-fry until done. Remove from heat. Prepare sauce: In a medium saucepan, mix together the cornstarch and water and stir until smooth. Gradually add the chicken stock, whisking until smooth. Add butter, soy sauce and oyster sauce. Bring mixture to a boil, whisking constantly. Let boil for a minute or so, still whisking, until mixture is slightly thickened. Remove from heat. Taste for seasoning, adding more salt if needed. Prepare batter: In a small bowl, mix together the cornstarch, flour and baking powder. Add the egg and water and beat with a whisk until smooth. Heat about 1 inch of neutral oil in a wok or skillet to 375° F. Dip chicken breasts in batter to coat. Fry in hot oil until golden, turning as necessary to cook evenly. Remove and drain on a rack or paper towels. While chicken is draining, warm sauce. Add pea pods to mushroom mixture and reheat, tossing to heat evenly. Cut chicken diagonally into strips. Place each sliced chicken breast on a bed of shredded lettuce. Spoon sauce over, then top with mushrooms and pea pods. Sprinkle with almonds and scallions. Never heard of it! I am convinced that deep frying and sweet sauces are our main contribution as a culture to the “American” portion of the Chinese-American equation. Good point. This one, at least, is not sweet. I admit I do have a fondness for old style Chinese-American. The biggest problem is that the places that still serve it tend to use ingredients that make me want to gag. And, yes, I do need to visit California—it’s been a while! That sounds delicious – I find the subject of real Chinese food and the other recipes quite fascinating – especially the secret menus for Chinese people only. I used to go to an amazing Chinese restaurant in Bristol with a Japanese friend who could read the Chinese characters on the secret blackboard, so I was lucky. Have you come across The Eater’s Guide to Chinese Characters by James D. McCawley? It’s fascinating, isn’t it? We love to visit Chinese (or at least Chinese-“ish”) places in other countries just to see how they adapt it. Like in Italy where it’s all forced into the antipasto/primo/secondo boxes. And, hey, I think we have that book! I’ve noticed lately that a lot of Indian restaurants seem to have adapted their menus to taste more like supermarket ready meals – I find that quite disturbing! I’m so sad to hear that! We ate at a sort of trendy Indian place in Birmingham a couple of years ago. Not a real Balti place—much to our regret, we just didn’t have time. We certainly did find that the supermarket Indian sections, while impressive in scope, seemed to be awfully full of “ready to eat” or nearly so stuff. Balti may have something in common with Chinese restaurant food. Aside from preservatives and high sugar content, the biggest problem with supermarket ready meals (IMHO) is that the meat and vegetables are cooked separately, then combined and cooled, so the meat is almost tasteless. On top of that I believe that a lot of the meat is reclaimed and reformed, from spinning the bones, etc. in a centrifuge. Very “appetising”! Am commenting from Down Under where eating and cooking ‘real’ Chinese is as common as blinking one’s eyes: definitely no chop suey, chow mein, the General’s Chicken or anything called ABC *big, big smile* !!! ‘Proper’ Chinese stirfries are probably the most common go-to dishes on busy nights! And a vast proportion of our numerous food bloggers are Asian. Your dish looks delightful and am certain tastes great . . . that said I simply cannot imagine using butter or batter!! Oh I love, love, love Szechuan food but also enjoy the elegance of Shanghai and courtly Beijing . . . and have fun with Nonya! Thanks you for the foodie history lesson: always delighted to learn . . .
You’re welcome, Eha. And I agree. Butter? Weird! Though I guess batter isn’t totally out of line. I mean, lots of dim sum dishes have some sort of a batter. It’s just fun to see how these things develop as they spread far and wide. Well, quite a good reason for being absent. Congratulations, how wonderful!! And how fitting for someone writing a book to cook up an “alphabet” chicken! Which, btw, looks wonderful (never heard of it, either). The picture is amazing, also! Merci, Sabine! We’ve cooked all sorts of crazy things in connection with the book. But most won’t make it onto this blog. Let’s just say that 1950s and 1960s American food was generally, well, blah… This one, though, I’d make again tonight if I had all the ingredients on hand! Hope you’re settling in nicely in Paris! Merci, Rosemary! Sorta takes one back to 1970-something, doesn’t it? Beautiful – good news about the book. This is a new one on me – but I’d certainly like to try it! Love the Chinese-American regionalized exotic history. Haven’t heard of it in Indiana. Looking forward to your book. And trying this recipe! Isn’t it fun? I wonder if there’s some “secret” Indiana Chinese-American dish? And thanks! Looks tasty, and no, I’ve never heard of it. Proving, I suppose, that Kentucky isn’t actually Southern at all. 🙂 Excited about your book! Merci, Roger! I generally agree about iceberg. But, lately, somehow, I’ve come to like it just a bit. For certain things. Like chopped salads (now there’s a really American thing). Thankfully, I have a couple of Chinese friends living here in Dublin. Going to authentic ex-pat Chinese restaurants, hidden up side streets in less than fashionable parts of town is a rare treat for me. I love it. My friend Bamboo (yes, that is her name) insists on ordering for us both (off menu) and surprising me with some delicious dishes unavailable to most westerners. I think Asians are too scattered everywhere they make this unique dishes everywhere we did not even know existed in China. Not against it at all, in fact its good as it represents a fusion of their culture and tradition together with the place where they are situated when they make them. Here in New Zealand Filipinos also try to improvise due to the lack of ingredients available making a totally different dish to the original. Fun, isn’t it? Your Filipino cuisine is so interesting, Raymund. It’s really unlike any other. Keep on teaching me about it! I just thinks this sounds and looks yummy regardless of the origin! When I think of chinese-american food at restaurants i just think of gloppiness and getting a terrific headache from the MSG. obviously i’m not a fan. But as you know, obviously, you can cut back on the corn starch, sugar and other offensive incredients and create pretty tasty and wonderful meals, like the one you photographed! Congratulations on the book! Are you going to retire first?!!! This looks wonderful! Will have to try this. Will also have to dig up that Chinese cookbook from the 1960s my husband bought for me. I’m sure I could find a vegetable recipe in there to complement this. What exciting news about your book. I’m sure it will be very interesting…just as the story behind your ABC dish. Loved the history lesson and the recipe! Thank you! And, its remarkably tasty, too.